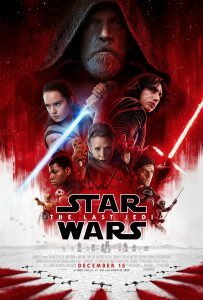 Simply put, I think The Last Jedi is marvelous! 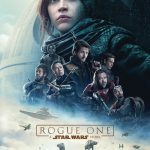 I am really confused as to why audiences are not responding well, but that is typical for the middle movie of a trilogy. I admit that this movie is quite different from any other Star Wars movie. It’s dark, with some light humor (often delivered by Oscar Isaac). It has some pretty intense moments; apparently I was, unknowingly, squeezing my wife’s hand throughout most of the film. It was so awesome to see Mark Hamill reprise his most iconic role and he was spectacular! Luke’s demeanor is exactly as I expected considering what happened to Ben Solo. 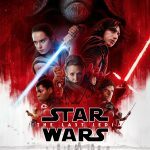 Daisy Ridley is still amazing as Rey and Adam Driver’s performance is equally as amazing! We also see new ways in which the Force is used, including a dramatic moment when Leia uses the Force. I’ll admit that there were a few scenes that were difficult to watch when Leia was the focus. There is a great moment where Luke and R2 share a nostalgic moment that clearly pays homage to “A New Hope”. It’s also a great tribute to Princess Leia. The last thing Luke says to Leia, in the movie, is perfect (and eerily fitting). Carrie Fisher’s death was unexpected and sudden but this movie is an unexpected tribute to her. Shortly into the credits a line was added (obviously in post-production) in which the film was dedicated to “our beloved princess”. The last time I saw a Star Wars movie on Opening Night was Revenge of the Sith. When you have a toddler, arranging the night to be toddler-free often becomes difficult. I was very excited to finally see an opening night release and I was rewarded with a couple collectibles. 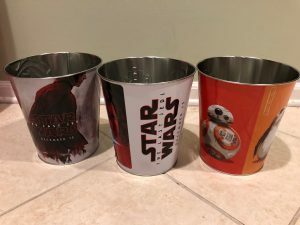 The AMC theater we went to were selling limited edition, opening night, metal popcorn tins (see picture). Naturally, I had to buy all three as souvenirs to commemorate the occasion. I cannot wait to see it again, hopefully before its Blu-ray release. There are also quite a few “theory-inducing” plot twists that I will discuss at a later date. More people need to see it before I talk about those. If you can get to a matinee, that seems to be the best option to avoid large crowds. I hope you enjoy it as much as I did. The Force. It calls to you. Just let it in. 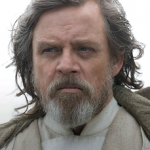 Star Wars: Are The Jedi Really Ending?!? ‘The Last Jedi’ Official Trailer Has Arrived!! 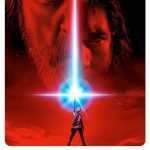 Official Episode VIII Title: The Last Jedi!